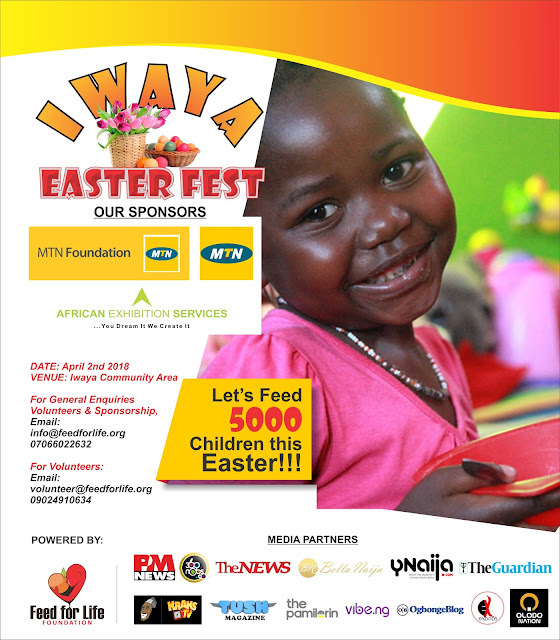 According to UNICEF, "Nigeria is the second largest contributor to the death of children under five years of age. In Nigeria, two out of five children do not get the nutrients they need for body and strength development, and over 13 million are affected in the country". 90,000 children are expected to die in Nigeria over the next 12 months, and unless we take action, 240 children will die every day. We feed hungry kids all over Nigeria. In communities with severe poverty, we bring hope and real help. Feed for Life gives kids the chance to learn again, providing backpacks and school supplies to families who can't afford them. OUR SPONSORS – MTN Foundation, MTN Nigeria and African Exhibition Services. OUR MEDIA PARTNERS – The Guardian Nigeria, Ynaija, Vibe Nigeria, Bella Naija, Unilag Olodo, Ogbonge Blog, Expoze, 360 Nobs, KraksTV, The Pamilerin, Tush Magazine, The News and PM News.